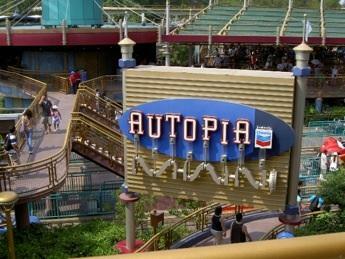 Popular rides such as Autopia normally have FASTPASS in place. Disney FASTPASS allows theme park visitors to avoid the hassle of waiting in long lines on some of the more popular rides and attractions. This concept lets you to reserve the time you will return to the ride. One of the major complaints about Disney theme parks -- or any amusement park for that matter -- is the amount of time one must spend waiting in line for a ride. Many times, visitors would rather shop, eat or go on a different ride where the wait time is much shorter. Disney park officials listened to this cry. In 1999, they developed the FASTPASS ticket system that allows guests to receive a free reservation time -- usually a 60-minute time frame -- on a few of the theme park's rides. Tickets are dispensed outside of the normal stand-by line on various rides throughout the Disney theme parks. After calculating the maximum number of riders per hour for each FASTPASS attraction, the system will automatically reserve a certain number of those slots. For instance, the Haunted Mansion at Disneyland can accommodate up to 2,000 riders hourly. A portion of those are set aside for FASTPASS and the others are slated for stand-by guests. However, once those slots are filled up for a given hour, Disney FASTPASS will give you a return time for the following hour and so on. On extremely popular rides such as Soarin' Over California (at California Adventure) or Space Mountain (at Disneyland), those slots are depleted very quickly and FASTPASS times are slated for much later in the day. Park visitors can only receive one Disney FASTPASS ticket for any given time frame. For instance, you cannot get a ticket for a time on Space Mountain if you hold a FASTPASS for the same time on Buzz Lightyear Astro Blasters. Nonetheless, once you are within your allotted return time on a ticket, you can then receive another FASTPASS for another ride or attraction. Guests can also only use their own park ticket or annual pass to receive a FASTPASS ticket. "Honey I Shrunk the Audience"
For the most part, using Disney FASTPASS to get on a ride at any of the Disney theme parks is a good idea. Just remember that if you lose your admittance or re-admittance ticket, you are out of luck. Make sure you check the stand-by time before you select your FASTPASS as that line may be shorter than your wait for your return time.